The community of Van Anda on Texada Island is a quiet, quaint village. The village is rich in history and experienced several gold rushes near the turn of the 19th century. In 1898 Copper and Gold were mined from Marbel Bay, and today Marbel Bay is the home of the Texada Island Marina & Boating Club. By 1898 Van Anda was a boom town! It was truly bustling, with Hotels, Saloons, Stores and an Opera House. This was not just any opera house, but the largest north of San Fransico at the time. It is said if you follow the power poles from the Lucky Dollar Food Store towards the Texada Island Inn that the poles follow the original Main Street. I have stood there many times, and it is hard to imagine that such a robust community existed over 100 years ago. It is hard to imagine that all of that took place in this sleepy little village. When you are in 'downtown' Van Anda today, ther is a Post Office, Lucky Dollar Food Store, and one other clothing store, T & T Apparell. The quaint post office is in the picture below as it appears today! The Lucky Dollar Store is your one stop for any grocery needs. They have their own butchered meats, fresh produce, fresh baked bread and buns, produce and a liquor store. There is no ATM in the market, but they do accept interact and credit cards. There are also movie rentals if you are looking to spend a night indoors while visiting. 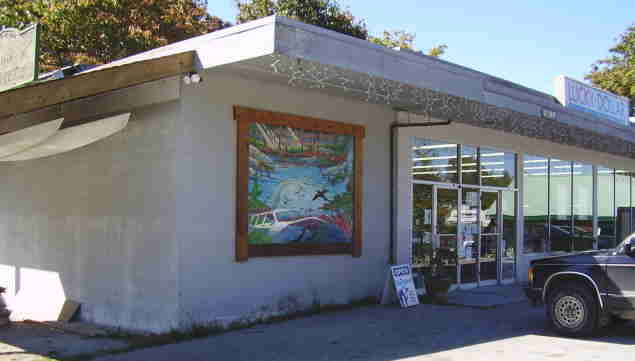 A short stroll from the Lucky Dollar also know as Texada Market, you will find the government wharf. This is the only wharf on the island that is able to accommodate large ships and it is in need of repair.